Thank you to all of the Illinois teachers that submitted class grant entries regarding Careers in Energy Week! The Consortium commends you all for your outstanding efforts in integrating Careers in Energy Week 2018 materials in your classroom lessons. View the 2018 winning entries. Pat Whiteside, VP of Business Support for Nicor Gas, presents Cori Nelson of Winfield Central School, this year’s IEWC Careers in Energy grant award winner, with her $250 award and Certificate of Appreciation for successfully highlighting careers in energy! Thank you to all of the Illinois teachers that submitted class grant entries regarding Careers in Energy Week! The Consortium commends you all for your outstanding efforts in integrating Careers in Energy Week 2017 materials in your classroom lessons. View the 2017 winning entries. IEWC Co-Chair Mary Zitek of the Association of Illinois Electric Cooperatives presented the award to Sheri Litherland at Bureau Valley South, Bureau Valley CUSD #340, in Buda, IL. IEWC Executive Sponsor Pat Whiteside, IEWC Career Awareness Task Force member Margi Schiemann and Bernie Anderson of Nicor Gas presented the award to Katie Buckley at LeRoy Preparatory Academy, LeRoy School District, in LeRoy, IL. 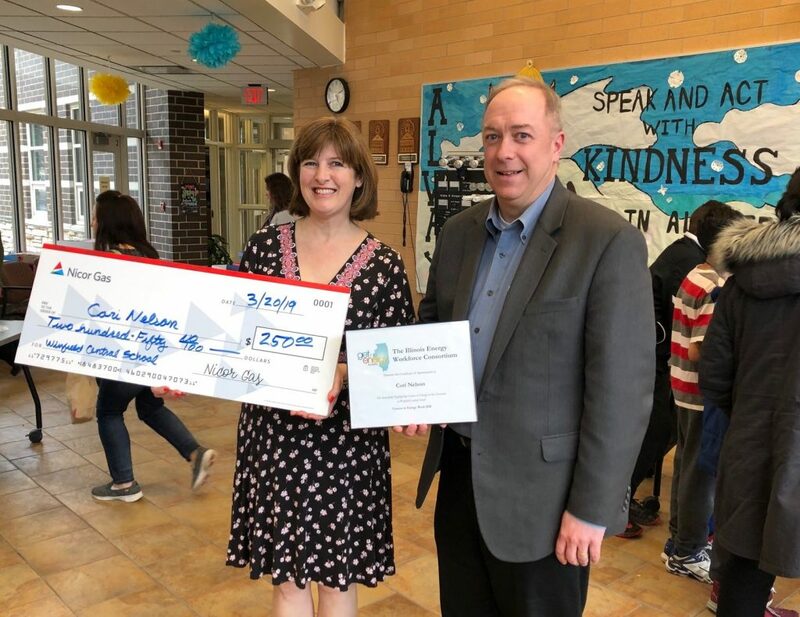 IEWC Education Task Force member Kathy Thigpen of ComEd presented the award to Dr. Heather Hampton at Hefferan STEAM Elementary School, City of Chicago School District 299, in Chicago, IL. 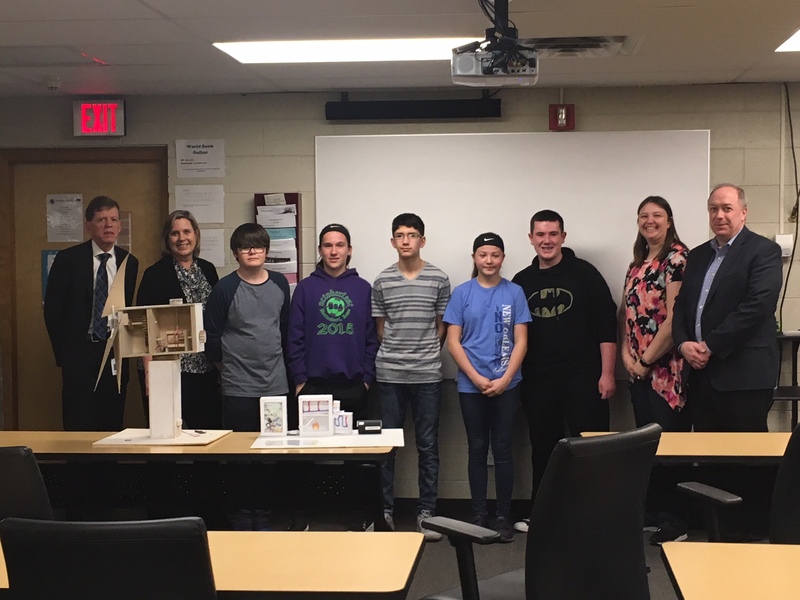 Hefferan STEAM Elementary School’s STEM curriculum displays some of the activities and projects the students worked on to develop their STEM knowledge. Governor Bruce Rauner proclaimed October 16-20, 2017, as Careers in Energy Week in Illinois! View the official proclamation! Careers in the energy sector are on the rise! The Illinois Department of Employment Security predicts there will be a growth of more than 50,000 energy-related jobs by 2022! 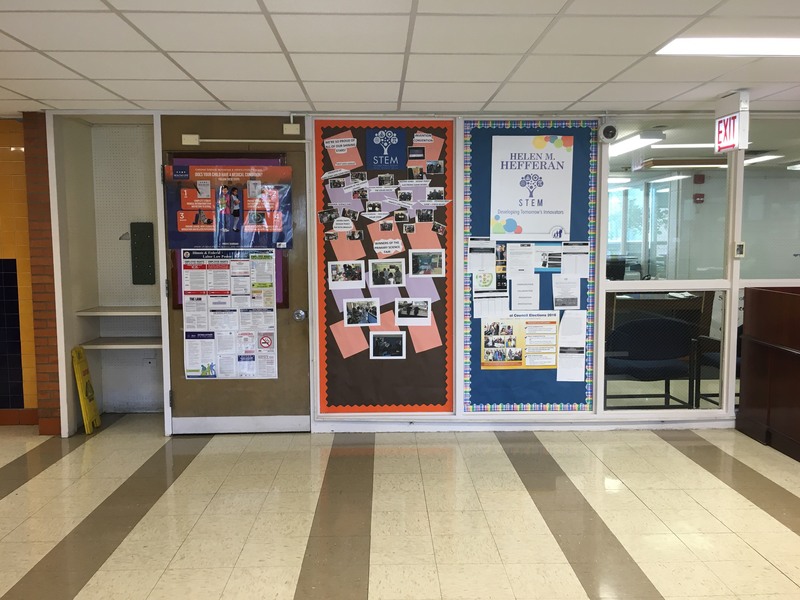 During Careers in Energy week, the Illinois Energy Workforce Consortium (IEWC) is providing free materials and an opportunity to win one of three $250 classroom grants to help you share these exciting career opportunities with your students! Illinois teachers are invited to share how they utilized any of the energy career materials provided (see links below) with their classes to be entered in a random drawing. Teachers can email a photo and brief (2-3 sentences) description of how they used these materials with students to illinois@consortia.getintoenergy.com with the subject line “Class Grant Entry.” Or, let’s get social! Use the hashtag #classgrant along with a photo and brief description on Facebook or Twitter. It’s that simple! Thank you to all of the Illinois teachers that submitted class grant entries regarding Careers in Energy Week! The Consortium commends you all for your outstanding efforts in integrating Careers in Energy Week 2016 materials in your classroom lessons. View the 2016 winning entries. 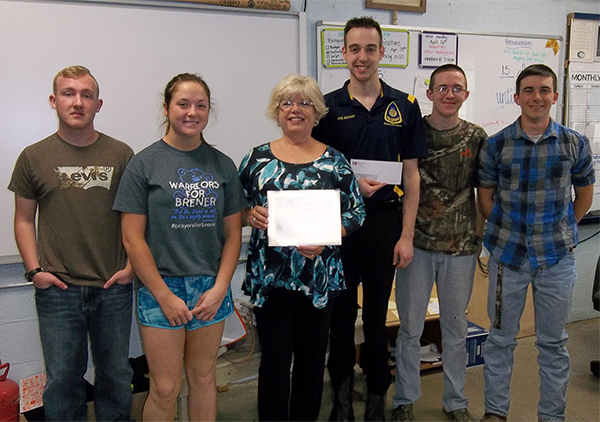 IEWC Co-Chair Mary Zitek of the Association of Illinois Electric Cooperatives presented the award to Brandon Smith at Payson Seymour High School, Payson CUSD #1, in Payson, IL. 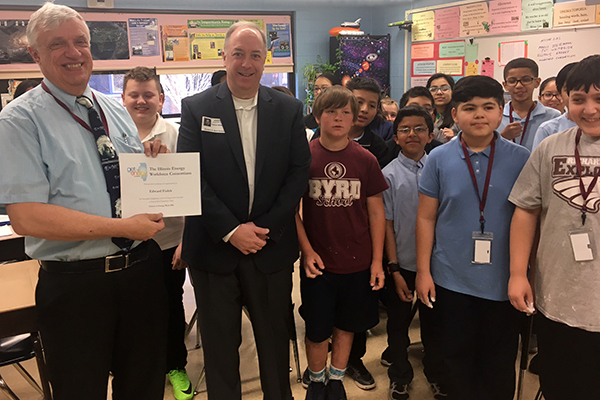 IEWC Executive Sponsor Pat Whiteside of Nicor Gas presented the award to Ed Fialek at Byrd School, Burbank School District 111, in Burbank, IL. 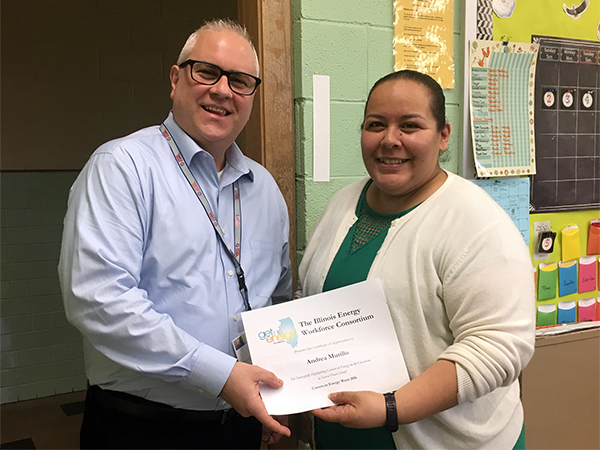 IEWC member Scott Tryner of Exelon presented the award to Andrea Murillo at Sacred Heart School in Chicago, IL. 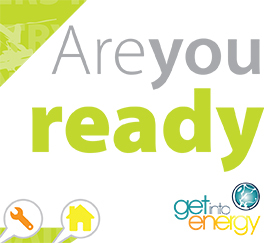 Are You Ready to Get Into Energy? Click the photo for a free flyer provided by the Center for Energy Workforce Development. You are welcome to print copies to share with your students. CEWD developed the national Careers in Energy Week to create awareness for energy careers. Free energy educational materials and energy careers data. Nicor Gas hosted a special web page that included descriptions of typical jobs at Nicor Gas along with photos, plus links to educational resources and a place for teachers to request a speaker. Digital ads regarding Careers in Energy Week were run on Facebook, Daily Herald, and Bloomington Pantagraph. A press release was issued to the Illinois media market. In partnership with the energySMART Elementary Education Program, a poster featuring energy career and energy efficiency messaging was distributed to 400 teachers, reaching about 25,000 students. Nicor Gas also participated in the Music of Science and Industry’s “Science Works: Cool Jobs, Hot Careers” event, Northern Illinois University’s STEM Fest, Joliet Junior College’s Career Exploration Fair, Orland Township’s Career Awareness Fair, and Prairie State College’s Career Preparation Network. Exelon and ComEd highlighted energy careers on their website and in social media posts. 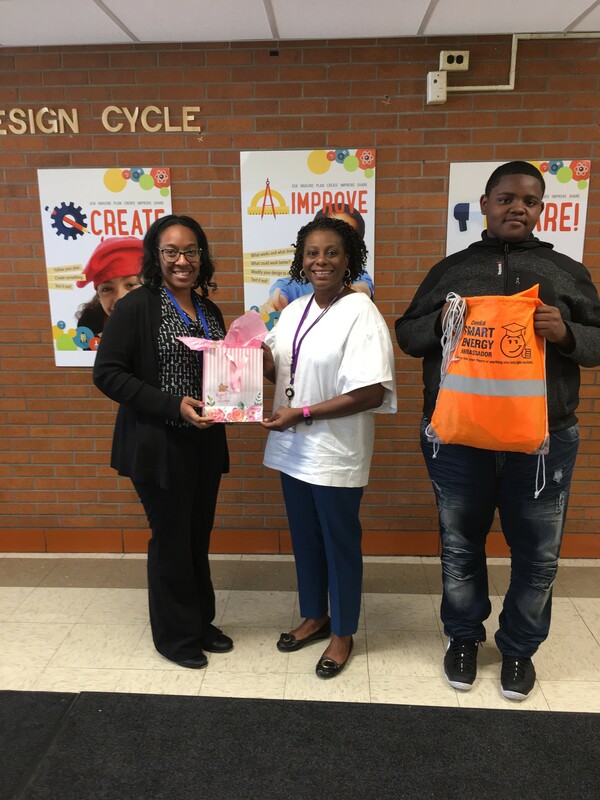 ComEd Human Resources and Training hosted an Open House for students in the line workers program at Dawson Tech during Careers in Energy Week. The students were engaged and inquisitive. Speakers from ComEd included Frank Gonzales, Regional Manager, who provided the welcome and insights from his career progression; Ryan Kenealy who is working in the overhead department, Omar Maldonado who is working in the substation department, and Dawn Berggren talked about Human Resources and the hiring process. Ameren had a webpage focusing on careers in energy including video interviews highlighting employees and specific career paths within the company. Their social media campaign for Careers in Energy Week included links to that information. Association of Illinois Electric Cooperatives had a web page dedicated to Careers in Energy Week and shared details on social media. Peoples Gas and North Shore Gas highlighted energy careers on social media and on their websites. Prairie State Generating Company, Primera Engineers, and S&C Company included career opportunities on their websites. Energy Learning Exchange coordinated industry and organization speakers for teachers that requested a specific topic of their choice to be discussed in their classrooms during Careers in Energy Week. Speakers included Steven Smith of Farnsworth Group speaking at Bureau Valley South, Brad Pnazek of Invenergy at Lincoln-Way East High School, Zachary Nelson of Invenergy at Winfield Central School, Kent Truckor of Invenergy at Richard E. Byrd Elementary School, and Annie McKeon from the Illinois Commerce Commission at Genevieve Melody STEM School. Classroom resources are also featured on the website for teachers to utilize throughout the year. 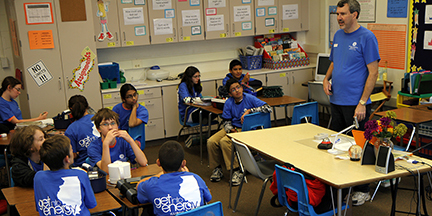 Thank you to the Illinois teachers that submitted class grant entries after last year’s Careers in Energy Week! The Consortium commends you all for your outstanding efforts in integrating Careers in Energy Week 2015 materials in your classroom lessons. Three winners (photos below) each received a $250 classroom grant from the Illinois Energy Workforce Consortium. The winners were selected at random in a drawing by the Consortium. View the 2015 winning entries. 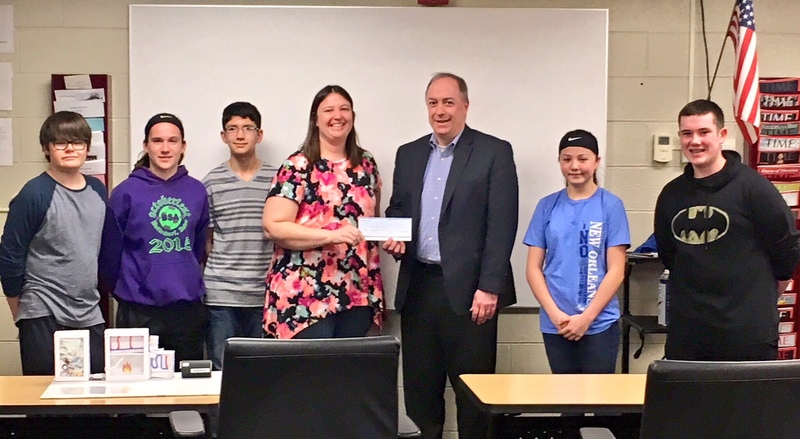 Amy Truemper with students at Bednarcik Junior High School, Oswego CUSD 308, award presented by Patrick Whiteside of Nicor Gas, Executive Sponsor of IEWC. 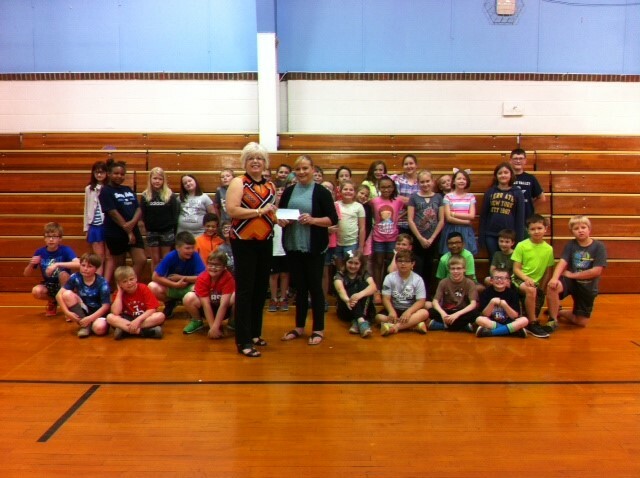 Laura Hultquist with students at Ladd Grade School, Ladd CCSD 94, award presented by Mary Zitek of the Association of Illinois Electric Cooperatives. 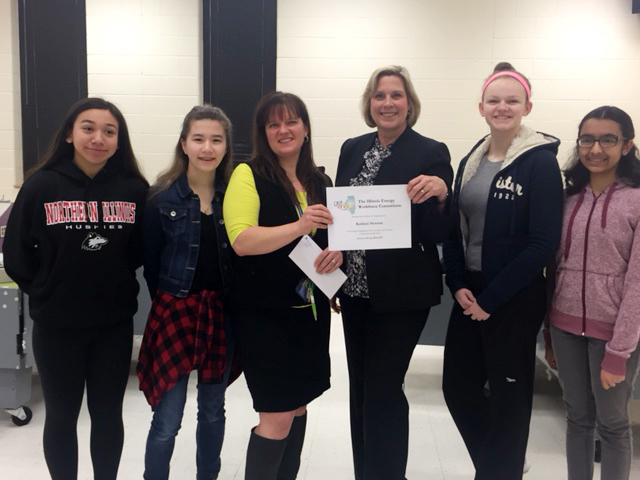 Kathryn Newton with students at Gemini Junior High School, East Maine SD 63, award presented by Margi Schiemann of Nicor Gas. Careers in Energy Week 2014 winning teachers are below. View the 2014 winning entries. 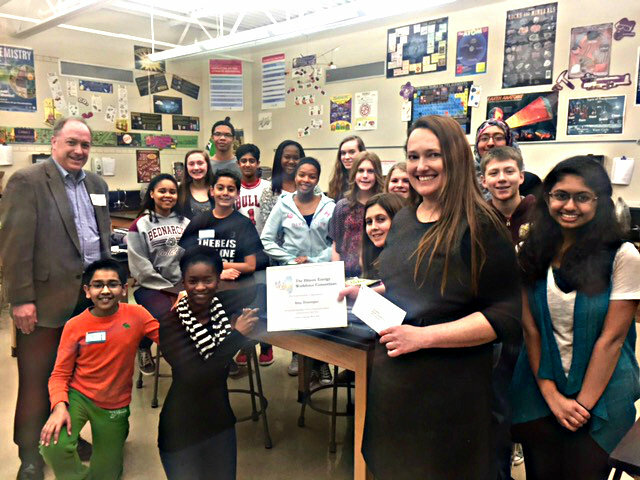 2014 Careers in Energy Week Grant Winners were In the photo above, Pat Whiteside of Nicor Gas presented the certificate of appreciation to Karen McDonald with her class at Donovan Junior-Senior High School in Donovan, IL. 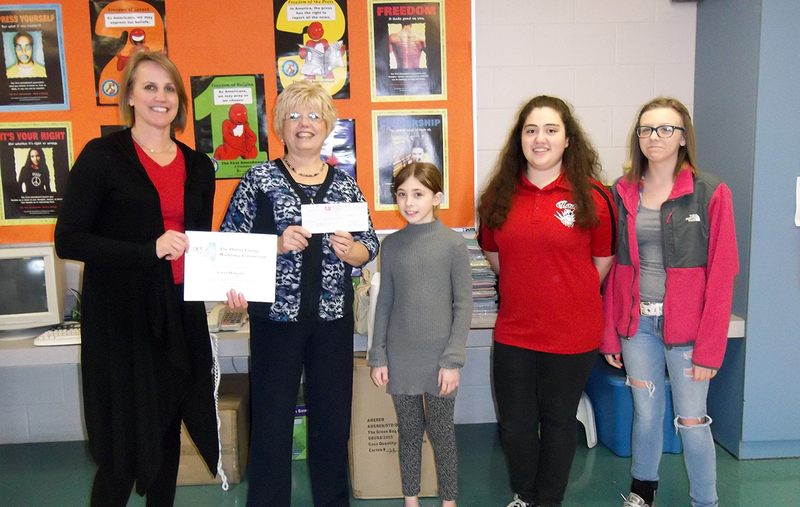 Mary Zitek of the Association of Illinois Electric Cooperatives presented the certificate to Kelli Thompson with her class at Lincolnwood High School in Raymond, IL, and in the middle photo to Karen Jones of Tonica Grade School in Tonica, IL.